The amazing Lula loader. 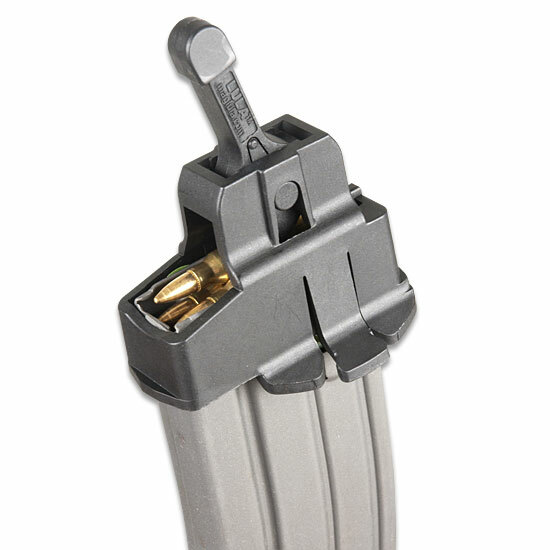 Loads and unloads a standard AR or AK magazine effortlessly in seconds. Snap the loader on and flip the lever back and forth as you drop in rounds. Loads a 30 round magazine in a few seconds without any thumb work. Snap onto a fully loaded magazine and flip the lever back and forth to unload almost instantly without pushing a single round out with your thumb, a real chore - if you've ever done it you know what I mean. This is an invaluable device that has been adopted by armed forces worldwide and is always on our bench.